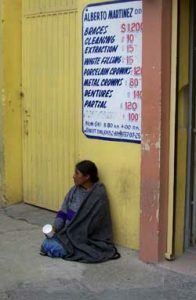 So, when reading the news from cities along the borderlands lately, it may not seem like such a good idea to travel over to Mexico for a day of shopping or an evening out. Which is a bit of a pity, for an excursion like that always seemed to be a fun thing; to visit a foreign country for a day, to enjoy the differences of "someplace else." 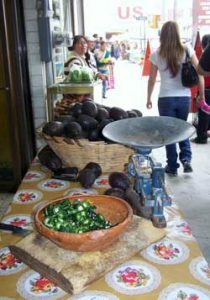 There was always a little frisson of excitement, to the experience; here was another language, different tastes, bolder colors, spicier tastes, exotic music on the radio, unusual things for sale in the shops . 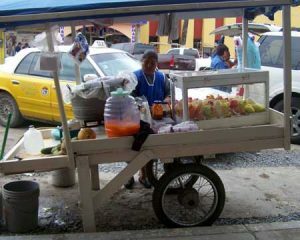 . . heck, even the shops were different, some of them being pushcarts, or even just a picnic rug spread on the sidewalk. The US is such a large country - as comedian Bill Cosby once observed, you could drive for days without ever hitting another language. Living somewhere within driving distance of a national boarder is therefore, a treat not generally bestowed upon most Americans - and that current threats prevent us from taking full advantage of that treat - well, it's just sad that some of the bigger cities on the Mexican side of the border are just not safe at present. Under certain circumstances, and in smaller border-towns, though, it still seems to be safe enough to pay a visit - as long as one stays on the main streets and with friends. 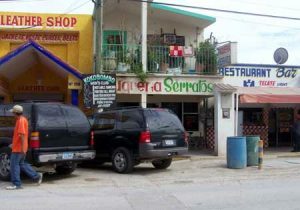 When I visited friends of a friend a week or so ago, at a Winter Texan/Snowbird nesting area in the Valley, we ventured over the border to Progresso, Mexico for an afternoon - and an absolutely splendid afternoon it proved to be, too. 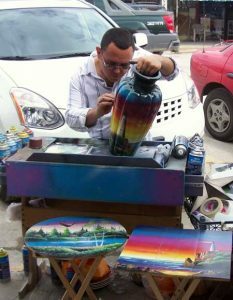 Progresso is a very small and well-condensed, as border towns go; the international shopping part being about six blocks long and maybe two or three wide, on either side of the Avenida Benito Juarez, which stretches from the international bridge. 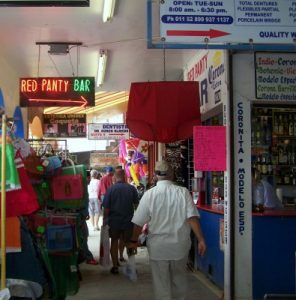 There were generous numbers of bars and honky-tonks, but they seemed to be rather straight-up places offering tasty adult beverages and soft-drinks, nothing skeevy or red-light-district-ish about them. Actually, I think the bars and honky-tonks were far outnumbered by pharmacies, dentists, plastic surgeons and beauticians - which is far more revealing about what Progresso's economy is really based on. Oh, and there were heaps of jewelry stores, with lots of silver and semi-precious stones on display: some from sidewalk vendors, but the very best was in permanent storefront establishments. 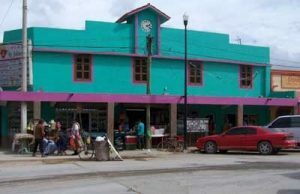 The city fathers of Progresso have also set up a couple of huge, multi-storied mercados - with neatly organized aisles of glassware and pottery, leather-work, fashions, art and kitchen utensils. Really, you could spend hours in the largest of them, which was barely half a block from the end of the bridge from the Texas side, and never had to venture any farther - but then, what would be the fun in that? Our friends recommended parking on the Texas side, and walking over - rather than be hung up in the traffic jam of vehicles returning. Be warned - New rules going into Mexico you will need a passport, or some kind of ID which is specific about your nationality and/or place of birth, in order to guarantee a hassle-free return - and be straight-up about what you have bought and are returning to the US with, as well. Other than that - Progresso is as much pure fun as a trip over the Border used to be.